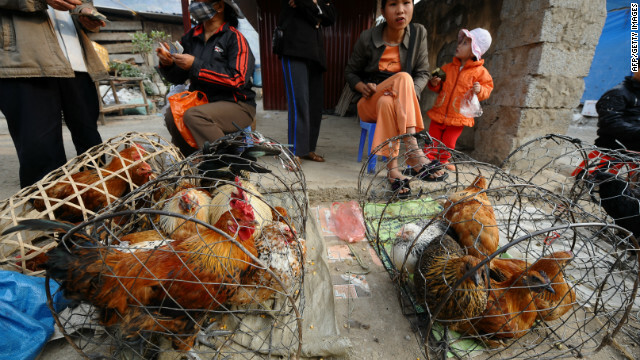 Live chickens are sold in the Ha Giang province of Vietnam, where avian flu has reemerged. An analysis from Nature shows that there's not as much flu surveillance as you might think. There were about 1,000 flu sequences from 400 avian virus samples collected in 2010, yet the world poultry population was 21 billion, the journal reported Wednesday. Countries such as Indonesia, Russia, India and Mexico contributed few samples to an international virus database despite large poultry populations. Brazil, with a poultry population of 1.27 billion, did not collect any avian flu samples - nor did Morocco, the Philippines, Colombia, Ecuador, Algeria, Venezuela and the Dominican Republic. The Nature report characterizes surveillance generally as ad hoc and reactive, responding to outbreaks or temporary projects rather than being consistent. That's a problem because global threats can emerge from a flu virus at any moment. Nature looked at avian and pig flu records at the U.S. National Center for Biotechnology Information's Influenza Virus Sequence Database between 2003 and 2011. This includes all subtypes of flu, not just the avian flu pandemic candidate H5N1. The database has seen a general increase in flu sequences deposited, but most of those sequences come from samples collected before 2003 or from the mid-2000s during an unusually prolific virus collection phase. Sylvie van der Werf, head of the Molecular Genetics of RNA Viruses lab at the Pasteur Institute in Paris, told Nature that there can be a huge time lag between the collection and sequencing of flu virus samples. The reason for this includes lack of funding for sequencing, although these costs are decreasing. And there's a lot of sequencing going on in retrospective research studies. And researchers often don't share their sequences until after they have published data about them. Sequences of such viruses should be given to public databases within three months, according to the Food and Agriculture Organization of the United Nations and the World Organization for Animal Health. Dr. Ian Lipkin, professor of epidemiology at Columbia University's Mailman School of Public Health, said he agrees that surveillance needs a boost. "Influenza surveillance is insufficient and inefficient," he wrote in an e-mail. "International leadership and commitment are key to mitigating the threat of pandemic influenza to human health and food security." Data from two experiments on the highly infectious H5N1 avian influenza are still on hold amid concerns that they could be used for terrorist purposes. A WHO committee said in February that these studies should be published in their full form, but did not decide when. Also last month, a study suggested that the death rate of H5N1 may be overblown. People should never forget that real health depends how well you take care of yourself and not what health insurance you carry but I agree health insurance is important for every one. Search~"Penny.Health"~or online for dollar a day insurance plans. Perhaps if there were a home testing solution by breathing into a tube and transmitting positives to the CDC or NIH??? Are there any Apps for that?? ?